I am so thrilled to bring you this lesson plan! While I usually don't write about myself, I did want to share a bit of my bio before introducing our new lesson plan. Before being the Director of Stories to Grow by, I was a teacher like most of you! I've taught every grade from 4th-12th, including adults, but my most favorite teaching years were when I taught 10th-12th grade. I taught Career Level, College Prep, Honors and my absolute favorite, 11th & 12th grade Advanced Placement English Literature & Composition. Working on this poetry analysis lesson geared for High School was an absolute pleasure as most of our works are for Elementary & Middle School students. I hope you enjoy it and find it useful for your own classroom. Happy Storytelling! Looking for a fun, engaging lesson plan to tie into Halloween while also meeting standards for Poetry Analysis? Our adapted version of The Goblin’s Market by Christina Rossetti is a thrilling poem which not only ties perfectly into an October unit, but also is perfect for a poetry analysis since it contains so many poetic features such as Rhyme, Figurative Language, Symbolism, and more! Two dear sisters; two different personalities. Sarah is enamored and mesmerized by the goblin’s market and their fruits for sale; Lizzie remembers the cautionary tale of a girl who had eaten the goblins fruit, and is deterred. Lizzie is able to fend off the goblins and their forbidden fruit, while Sarah succumbs to the trickery. Can Lizzie save her once the damage is done? 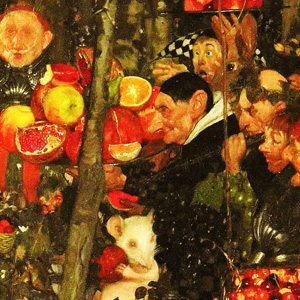 A poem chock full of Themes, Symbolism, Imagery, Figurative language and Allusion (beware the “forbidden fruit”) which could easily springboard this lesson plan into many...this poem is one that will keep your students on their toes while learning valuable skills in analyzing poetry and its much deeper meaning. This lesson plans meets Common Core Standards for CCSS.ELA-LITERACY.RL: 10th-12th grade, with strands in Key Ideas & Details, Craft and Structure, and Integration of Knowledge and Ideas (Depending on what your focus is with this poem analysis). Objectives: Use higher-level thinking skills to analyze a piece of poetry, focusing on poetry elements: Structure, Language, Details and Themes to determine the Author’s Purpose. Anticipatory Set: Assuming the notion that Good usually prevails over Evil, describe a time in a piece of literature where Evil prevailed, even if only for a bit. Activities: Students will read The Goblin’s Market Poem first to themselves, then read orally (I like to read myself so students are free to focus on the language and rhythm and taking a second look at some of the poetic elements while I read). It is then time for the analysis. This lesson assumes that students are familiar with the main poetic elements: break the students into groups and give each group 3-4 stanzas. Print out copies of the poem so students can annotate on their paper…groups should identify: Rhyme Scheme, Figurative Language (Most stanzas have examples of Alliteration, Simile, Metaphor), Imagery, Diction, Tone. I like to have each person in a group in charge of each element and then they discuss the findings among the group. Once the groups are complete, I have each group present their part and their findings so students can mark up their own poems. This will assist with the final task: finding the Theme & Author’s purpose of the poem. This leads to the discussion and determination of the Theme of the poem. As a challenge, I would ask the students to also identify the Allusion in the poem (depending on grade and level). Discussing this as a group will help students with the closing task of identifying the Author’s Purpose. Closing: Explore the Allusion with the class of the “Forbidden Fruit”. Have students return to their groups to define what they think the Author’s Purpose was with this piece. They must include at least three pieces of evidence from the text to support their hypothesis. Extension: Discuss the layers of the poem. Students should walk away with an understanding that the base layer of the Theme of a piece of work does not always correlate with the deeper meaning of the Author’s Purpose for writing the piece. As an extension activity and to meet common core standards, students could then analyze the Bible passage from Genesis about the forbidden fruit and compare/contrast with this poem.